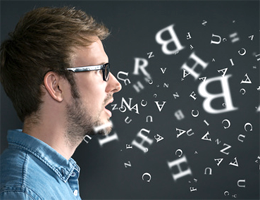 Defects in the gene FOXP2 result in a severe speech disorder. As LMU researchers now show, when the functional version of the human gene is introduced into mice, it facilitates learning, and alters neuronal circuits in the brain which may have played a role in the evolution of language. The ability to acquire and creatively manipulate spoken language is unique to humans. “The genetic changes that occurred over the past 6 million years of human evolution to make this possible are largely unknown, but Foxp2 is the best candidate gene we now have,” says Wolfgang Enard, Professor of Anthropology and Human Biology at LMU. In his efforts to understand the molecular biological basis of language Enard has now taken an important step forward. The results of his latest study, undertaken in collaboration with scientists at several universities, including the Massachusetts Institute of Technology in Cambridge and the Max Planck Institute for Evolutionary Anthropology, have recently appeared in the journal Proceedings of the National Academy of Sciences (PNAS). The human homolog of Foxp2 codes for a protein – a so-called transcription factor – that regulates the activity of hundreds of genes expressed in various mammalian cell types. Individuals who carry only one functional copy of the gene instead of the usual two experience specific difficulties in learning to speak and in language comprehension. “Genetic mutations that occurred during the 6 million years since our lineage diverged from that of chimpanzees have resulted in localized alterations in two regions of the Foxp2 protein. That is quite striking when one considers that the normal mouse version differs from that found in chimps by only a single mutation, although these two species are separated by over 100 million years of evolution. The question is how the human variant of this transcription factor contributes to the process of language acquisition,” says Enard. Enard and his coworkers had previously shown that the alterations in the human gene for Foxp2 specifically affect certain regions of the brain. When the two human-specific substitutions were introduced into the mouse version of the gene, he and his team observed anatomical changes exclusively in two neuronal circuits in the basal ganglia of the mouse cortex, which are involved in the control of motor function. “These circuits play a crucial role in the acquisition of habitual behaviors and other cognitive and motor capabilities,” Enard explains. In their latest work with the same mouse model, Enard and his collaborators found that, under certain conditions, the human version of Foxp2 actually enhances learning. “We have shown for the first time that the evolved alterations in the human gene have an effect on learning ability. The human version modifies the balance between declarative and motor neuron circuits in the brain. As a result, the mice take less time to associate a given stimulus with the appropriate response, and hence learn more rapidly,” says Enard. Learning to speak clearly requires interactions between conscious “declarative” knowledge and the unconscious effects of repetitive stimulation of particular patterns of neural activity. “As we learn, the underlying neuronal processes become automated, they are converted into routine procedures, enabling us to learn faster,” Enard explains. Using various tests, the researchers demonstrated that the human-specific mutations enhance cooperative interactions between the two affected circuits in the basal ganglia of the mouse brain. “The human variant of the Foxp2 gene modulates the associative and sensorimotor nerve connections formed, as well as levels of the neurotransmitter dopamine in the basal ganglia, during the learning process. The increased ability to switch between conscious and unconscious forms of learning may play a role in the acquisition of language,” Enard concludes.